What’s So Special About the White Whale? As two of the most unique and legendary members of the monodontidae family, the narwhal and beluga whales are as precious to our understanding of natural history as they are to our grasp of our planet’s present condition. 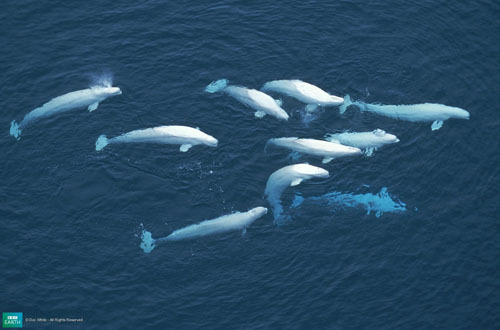 You could be mistaken for thinking that these white whales were not something to shout about with their medium length bodies (in comparison to their much greater kin! ), short snouts, and absence of a true dorsal fin. However these oceanic stars have shining lights of their very own. If you haven’t come across the beluga whale before, you are in for treat… and not just a visual one. Refreshingly nicknamed the “Sea Canary” by early Arctic sailors, this sociable marine mammal uses a wide range of high pitched whistles, screeches, clicks, and squeaks to communicate. According to one Japanese researcher, it’s not just to each other. It was claimed that it was possible to “talk” to the beluga by attributing three distinct sounds to three objects and then playing games in identifying which went with which. This not only exercised the whales’ intelligence, but also gave hope that one day humans and sea mammals might be able to exchange more valuable information. However, we must also remember that these unmistakable all-white whales (who can be heard through the hulls of ships) do just make noise for the fun of it, as this video of a beluga back scrubbing party quite notably shows. However weird and wonderful this sea creature may be, it definitely is a contender for being better known in fiction rather than fact. Appearing alongside the beluga is another very vocal, cold water loving, deep sea diver: the narwhal. However with this sea mammal, it is definitely all about looks. Most commonly accepted as having a feature similar in purpose to a lion’s mane or a peacock’s tail feather, the narwhal have a tusk which can be up to 10 feet long! And when compared with a body length similar to the belugas’ at a medium-sized 16 feet, that’s quite a tooth! 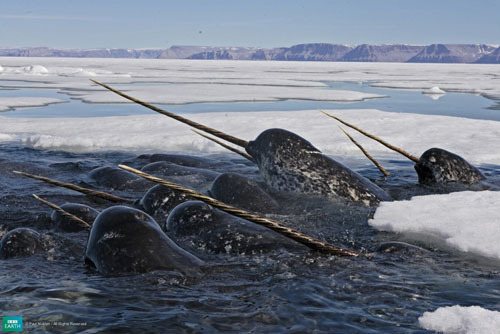 Living year-round in the Arctic, but migrating seasonally to be closer to the coasts, the narwhal are unique in their ability to hunt more successfully in the deep-waters during the winter, than the shallows during the summer. Which begs the question: why do these mammals migrate at all? The answer. To mate and give birth. It’s while in these coastal bays that the white whales will not only enjoy the open water, and a sea bottom of scratchy gravel and crushed stone (as seen in the moulting video above)… they’ll also take advantage of the safer and gentler climate of the bays to give birth to their young. After mating in the deep waters during the winter migration approximately 14 to 15 months prior, the beluga and the narwhal mothers will both split into their respective nursing pods and give birth usually around the summer months of June and July. Luckily (especially for the narwhal!) these marine mammals give birth to their young tail first, however neither will be born in the immediate likeness to their parents. The beluga calf takes on a greyish brown color, and the narwhal males don’t develop any form of tusk until the first few years of life. The calves will commonly return to these same estuaries when they are fully-grown, sometimes even meeting their mothers again. And the cycle of life continues.